Trash will be picked up curbside every week. Trash Containers shall be metal or plastic, water tight, have handles, not to exceed 32 gallons, and weigh no more than 20 pounds when filled. Plastic bags may be used in place of containers, but must not be overloaded or ruptured. Metal drums not originally designed to contain trash are NOT acceptable. Please secure trash from animals. All trash must be placed at the curb before 6:00 am on trash day, but not before 6:00 pm on the day prior to collection. After collection any empty containers shall be removed from the curbside promptly. Do not park in front of trash containers or otherwise block access to your trash on trash day. Bulk Trash Pick-up is the first Tuesday of each month. Items must be placed at curbside with the proper amount of stickers attached. Household trash and bulk items need trash stickers placed on them. Stickers cost $1.50 and may be purchased at the Township Tax Office, Walgreens or Acme. Township Ordinance requires that when purchasing stickers one must give the following information: name of the user, the address of the property adjacent to which the waste will be placed for collection and the nature of the use of the property. The stickers are nontransferable; however, they may be redeemed from the Township at a cost if the user decides that there is no further use required. Every container of trash must have trash sticker on it. If you use trash cans, place the sticker on the top item in the can so it is plainly visible when the lid is removed by the collector. Stickers will be disposed of with the trash and will not be reusable. If there is no sticker as required, the trash will not be collected. Any trash or construction debris generated by a contractor is the responsibility of the contractor and homeowner. The Township will not remove this waste, even if it is placed curb side. Residents should insist that the contractor use a dumpster and private waste hauler for construction waste. Waste that does not comply will not be picked up until is is brought into compliance with these regulations. For More information on Recycle Coach, click here. Recyclables will be picked up curbside every other week the same day as your scheduled trash pickup. 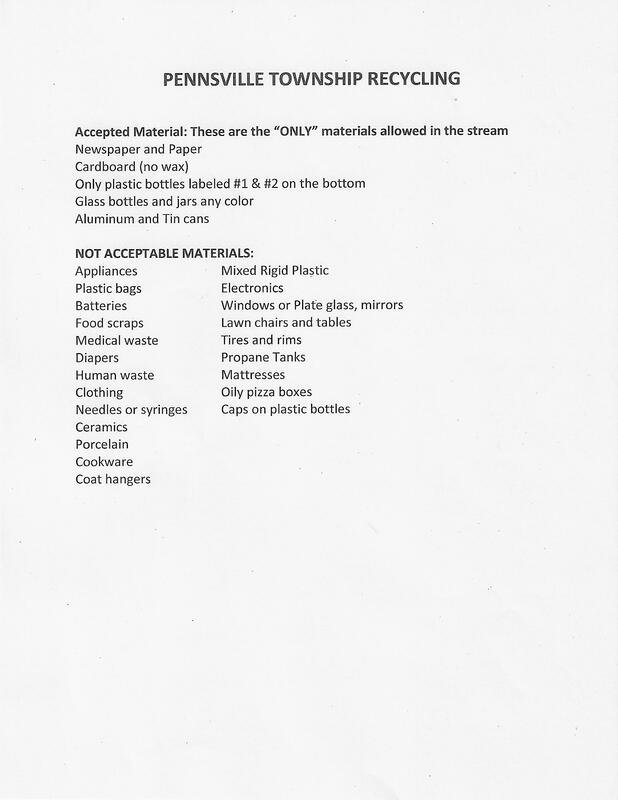 Residents may also bring Recyclables to the Industrial Road Complex during regular business hours. Household items such as toasters, cookware, etc. Used Motor Oil and Batteries are to be taken to the Industrial Road Complex. Monday-Friday 7:00 am to 3:30 pm. Saturdays 8:00 am to 12 Noon. The improper disposal of household hazardous wastes can cause problems for the entire community. Some wastes are toxic to humans or wildlife, while others can cause serious heart problems. NEVER dump hazardous chemicals down the drain or toilet, on the ground, down catch basins or storm drains where they could contaminate soil or be carried into local streams and sources of drinking water. Federal law allows only licensed hazardous waste haulers to handle hazardous waste. The Township will not pick up any hazardous or combustible waste. Any product which is labeled “warning, caution, poisonous, toxic, flammable, ocrrosive, reactive or explosive” is considered hazardous. This includes household products containing toxic chemicals, ammunition, paint, pesticides, herbicides, turpentine, lighter fluid, photographic and pool chemicals, rat poisons, car batteries and other hazardous materials. 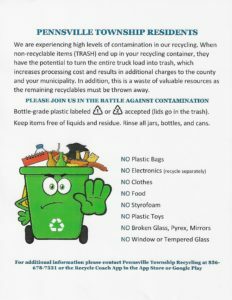 The Salem County Improvement Authority has a Household Hazardous Waste Collection Day two times a year. You may call 856-935-7900 to find out the dates and more information. A map detailing trash pick up days and routes is available below. A schedule detailing holidays and changes to the schedule is available via the calendar on the Homepage. 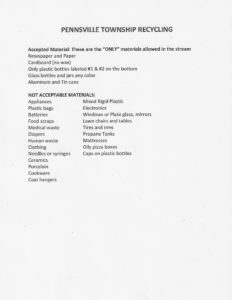 These items can be taken to the Salem County Improvement Authority. Call 856-935-7900 for more information.